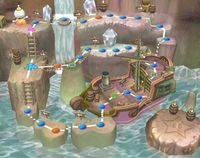 Pirate Dream is a board map from the Dream Depot in the game Mario Party 5. It was created from dreams of adventure, and resembles a grotto similar in layout to the waterfall room in Pirate's Grotto from Keelhaul Key, a location in Paper Mario: The Thousand-Year Door. Additionally, the map is reminiscent of an abandoned mine and a seaside cliff. Landing on a Happening Space on the mine track causes a boulder to come rolling out of the mine, chasing players in its way off the track. Landing on one of the Happening Spaces on the waterfall causes it to give way and the player falls down the waterfall to a space in front of the pirate ship. The Happening Space on the pirate ship makes players jump into its cannon and blast off to a space with a cannon sign next to it. Finally, landing on the Happening Space at the top of the board makes Monty Mole come out to give players a chance to dig for coins. All they have to do is tap the button constantly to dig coins out with the pickax. This is the only board in the game to have Thwomp and Whomp. 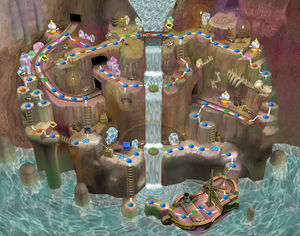 Thwomp gives players a lift to a higher part of the board for 10 coins. For the same price, Whomp lets players use the ladder he is blocking. This page was last edited on October 4, 2018, at 23:16.